A long-standing Preferred Solutions Developer for Cisco, announced that they have expanded their relationship with Cisco, with NICE becoming a part of the Cisco SolutionsPlus program for Cisco MediaSense. Cisco SolutionsPlus is a program that delivers a one-stop ordering experience for Cisco’s customers, channel partners, and sales teams for select third-party products and applications. Cisco will be offering NICE SmartCenter business solutions and the following Workforce Optimization products as part of their SolutionsPlus program: NICE Interaction Management, NICE Quality Management, and NICE Interaction Analytics. 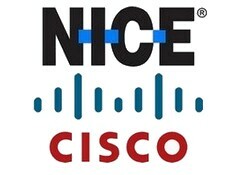 NICE has been a Cisco technology partner since 2000, and has achieved the highest level of Preferred Solution Developer in the Cisco Developer Network program. NICE interoperates with Cisco Unified Communications Manager, Cisco Unified Contact Center Enterprise, Cisco MediaSense, and other Cisco products.